I know I said I had everything under control in terms of cooking real food, and I did. Briefly. But then I decided to renovate our little log cabin — a rather ambitious project that involves messy, time-consuming things like drywall and terribly inconvenient things like gutting the entire kitchen (the entirety of which is a mere 62 square feet, but still). And a couple of months ago, Chris popped into our not-yet-gutted kitchen to announce that he wanted to be with me all the time forever, so I’m also planning a wedding. It’s a very small, very casual wedding (as far as weddings go), but still. Then there is also the small matter of my actual job and the fact that I’m pretty obsessive about pretty much everything. These are not the sort of conditions that foster creativity in the kitchen. These are more the sort of conditions that foster major meltdowns in the grocery. I know this because I recently had such a meltdown. It involved a box of Rice-a-Roni, which is pretty much rock bottom for me. I’m not saying you shouldn’t buy Rice-a-Roni. Actually, yes, I am saying that. You shouldn’t buy Rice-a-Roni. I shouldn’t buy Rice-a-Roni. Nobody should buy Rice-a-Roni. Real food is important, and it is really really easy to make rice. Sometimes we buy Rice-a-Roni anyway. I get that. Despite the home renovation and the wedding plans, I intend to do more with this blog than pop in every four months to announce that I got too busy to cook anything worth mentioning but I promise to be good from now on. A girl can only do that so many times (two?) before she starts to look silly. Plus, maintaining a blog about seasonal cooking helps discourage me from buying packaged crap. I tossed in a handful of salad greens, but I think the salad is actually better without them. The greens appear in the photo but not in the recipe. Feel free to add them if you like. 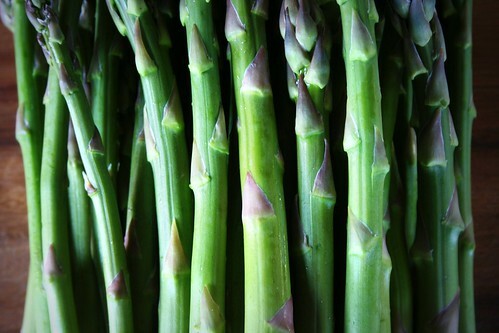 1) Trim woody ends from asparagus and slice on the diagonal into ¼” thick slices. 2) In a large sauté pan, heat ¼ c. olive oil over medium-high heat. 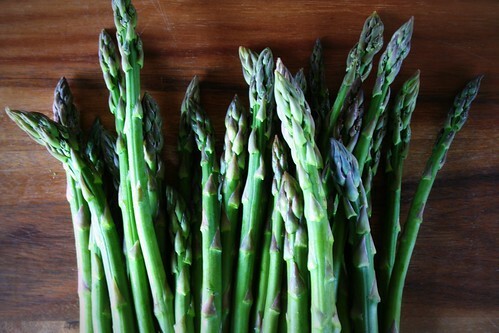 Add the asparagus and sauté for about 1 minute. Add the garlic and sauté for about 30 seconds. Stir in the beans, lemon juice and zest, then season with salt and pepper. Remove from heat and let stand, uncovered, for 10 minutes. 3) Brush both sides of the bread with remaining 2 T. olive oil and grill (or broil, if you’d prefer) over high heat until nicely browned, about 3-5 minutes. 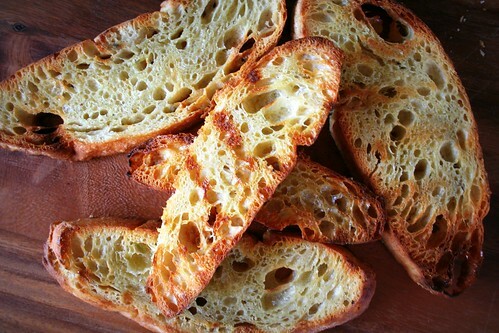 Cool slightly and tear the bread into bite-sized chunks. 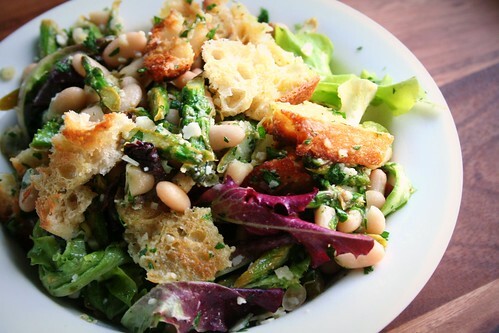 4) Spoon asparagus & bean mixture into large bowl, add torn bread, and toss to combine. Shave cheese over salad, sprinkle with parsley, and toss again before serving warm.